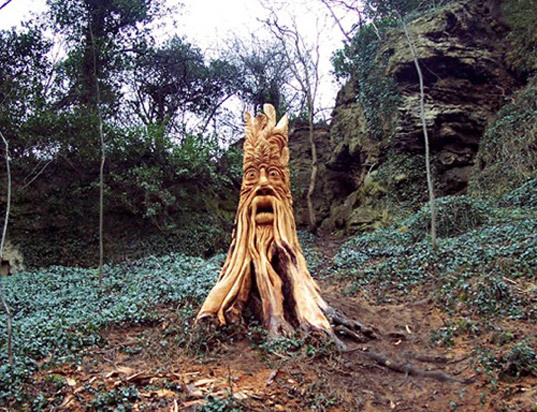 For several weeks, residents in Knaresborough, North Yorkshire were baffled when a cadre of mystical creatures suddenly appeared in their surrounding woods - the enchanted forest sprouted a dragon, a kingfisher, and a ghoul standing over 10 feet high. Now local chainsaw carver Tommy Craggs has come forward as the mystery artist - check out our gallery for a closer look at his repertoire of intricately carved wooden sculptures! After the great reveal, the residents of Knaresborough actually became fans of Craggs’ work, and they now look forward to seeing more sculptures pop up around town. This is not the artist’s first public exhibition – Craggs has competed in chainsaw carving competitions all over the world, earning commissions outside homes, cafes, and fairs in many countries. One of his biggest pieces is a collection of wild animal lining the trails of a nature walk in Allensford Park in Durham, England. Visitors can enjoy the outdoors while following the serpentine tail of a lizard, the jagged back of a toad, or the delicate wings of a giant wooden butterfly. Previously a tree feller, Craggs’ expert carvings are an expression of his deeply seeded interest in art and beauty, as well as his knowledge of wood and nature. With dozens of carved sculptures under his belt, we hope he heads to the U.S. soon to share his awesome skills. After the great reveal, the residents of Knaresborough actually became fans of Craggs' work, and they now look forward to seeing more sculptures pop up around town. One of his biggest pieces is a collection of wild animal lining the trails of a nature walk in Allensford Park in Durham, England. 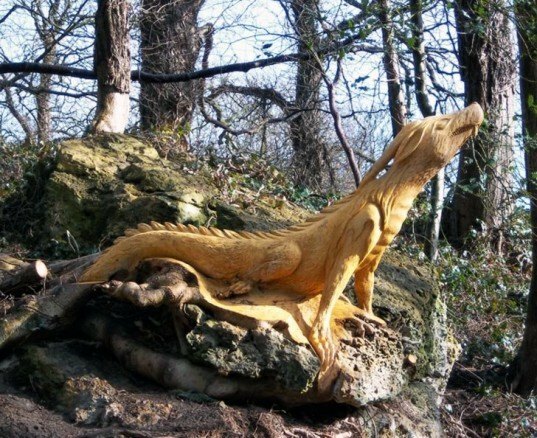 This is not the artist's first public exhibition - Craggs has competed in chainsaw carving competitions all over the world, earning commissions outside homes, cafes, and fairs in many countries. Visitors can enjoy the outdoors while following the serpentine tail of a lizard, the jagged back of a toad, or the delicate wings of a giant wooden butterfly. Previously a tree feller, Craggs' expert carvings are an expression of his deeply seeded interest in art and beauty, as well as his knowledge of wood and nature. With dozens of carved sculptures under his belt, we hope he heads to the U.S. soon to share his awesome skills.